+ Lower health and hunger. + Run faster in spring, but slower in winter. + More vulnerable to coldness in winter. + Still working on the speech file. + Modify art a little. 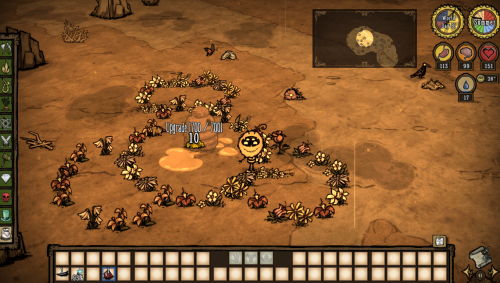 + In addition to upgradeable, now it's growable, and will fully grow in 20 days. This is to reduce the action of destroying too many normal beehives to get honeycombs to upgrade the beehive. 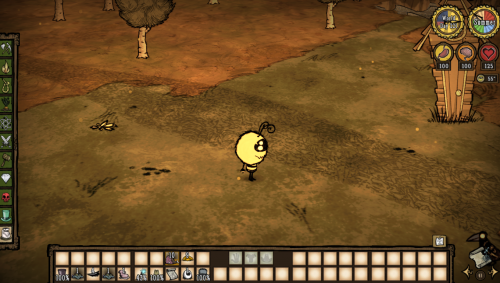 + It now can repair itself ( regen HP ) based on number of bees inside. + Modify spawning condition to be able to spawn in cave. + Rebalance the number of bees, regen time, release time and enemy watching distance. + Make sure to drop the cocoon after being killed, hammered or burnt. + Now has a map icon. 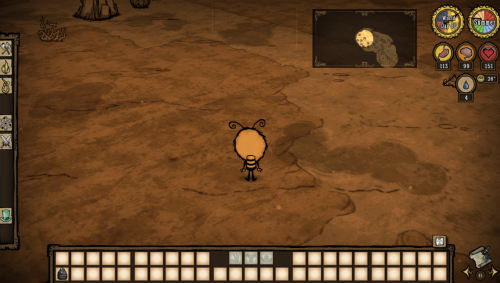 + Will automatically drop off a player's inventory if the player does not own the cocoon ( Like Lucy the Axe ). This also works with mobs like Lure plant and Krampus. - Beehive and cocoon ownership : Now each Ozzy player can only have 1 beehive or 1 cocoon, just like Woodie players with Lucy axes. 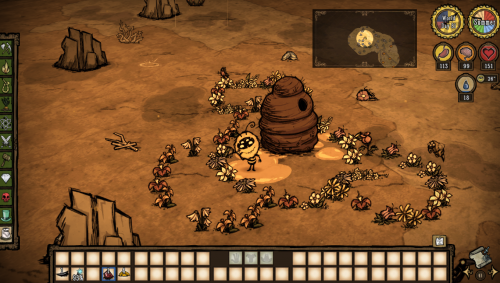 In v1.1.0, if an Ozzy drops the cocoon and leaves game, the others can use it to build a beehive, which is kinda too OP and buggy. Also, as mentioned above, no one can take the hive or the cocoon from Ozzy, unless he drops it somewhere and forgets. + Spring : The bees deal poison damage over time and move faster. 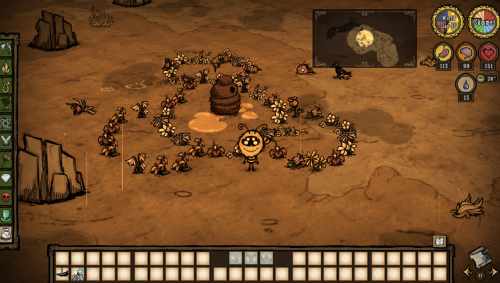 + Summer : The bees have half the HP, and explode on death dealing area damage ( cuz it's too hot in summer ). 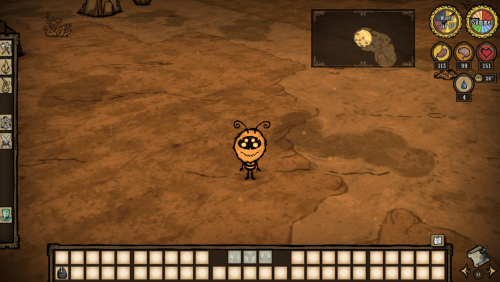 + Autumn : The bees will have ranged attacks but slower attack speed, and can kite the enemy to some extent ( this really took me a lot of time ). 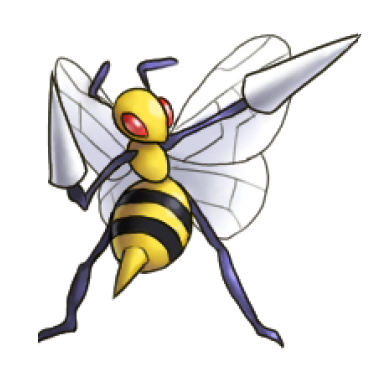 However, because they fire their stingers out, each attack will cost them some HP. + Winter : The bees cause enemy to attack and move slower. They also move and attack slower. 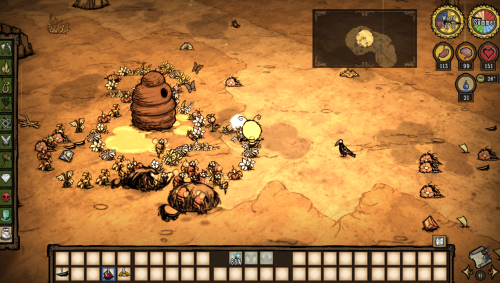 + Reduce the loot drop rate to avoid too much stingers and honey. - Still no special weapon, so Ozzy is kinda weak without the beehive. - Maybe make him able to shelter in the beehive, like a tent. - Add someway to make bees followers to join battle faraway.